Relative to the Earth, the Sun is pretty big. However, it’s also 93 million miles away. The product of these two facts is that it subtends an area of the sky of approximately 60 µsr (60 Micro-Steradians). This is about the same size as your thumbnail, when you hold your hand out at arm's length. The Steradian is a normalized measurement for solid angles. It’s the solid angle (3D) equivalent of radians, which are dimensionless measurements of 2D angles relative to a circle. A surface patch of area r2 on a sphere of radius r, subtends 1 Steradian. There are 4π Steradians in sphere. The 60 µsr for the Sun, is a measure of the area the ‘disc’ of the Sun takes up in the sphere of the celestial sky. For comparison, the area that Switzerland covers on the surface of the Earth is approximately 1.2 msr (milli-Steradians). Mars and Pluto, respectively, when viewed at their closest approaches to Earth subtend 11 nsr (nano-Steradians), and 0.24 psr (pico-Steradians). Our Moon is considerably smaller than our Sun, but it’s also a lot closer. The Moon has a diameter about 1/400th of that of the Sun. Coincidentally, it’s also approximately 400 times closer. A consequence of these facts is that the moon subtends approximately the same angle as the Sun. Both bodies appear approximately the same size in the sky. This is a great coincidence. The Sun and Moon appear approximately the same size when viewed from the Earth. Because the Sun is the source of light for our planet, and light waves travel in a straight lines, then the Moon passing in front of the Sun temporarily can block out the light from the Sun. This phenomenon is called a Solar Eclipse. Depending on where you are on the planet when the Syzygy occurs you will experience different phenomena. If you are in a location of the planet where geometry results in the entire obfuscation of the Sun by the Moon, you will experience a Total Eclipse. You are in a region called the Umbra (The Latin word for 'shadow'). If you are lucky enough to experience a total eclipse it's a fantastical experience. Day turns into night for a couple of minutes. Animals get confused; birds stop singing. If you were not aware of the science behind what is going on, it's easy to see how you might get really scared, confussed, and believe in the foreboding of some cataclysmic event at the wrath of some angry deity. Surrounding the umbra is a region called the Penumbra. If you are located inside this region, geometry results in the Moon partially obscuring the Sun for a short time. You experience something called a Partial Eclipse. It also gets a little darker in a partial eclipse (The effect depending on how deep or shallow you are in the penumba), but the Sun is never totally obscured. In a partial eclipse if you observed the Sun*, you'd see the Moon passing slowy infront of it. This is also a very fantastical experience. Depending on how close you are to the umbra, the shadow of the Moon will carve into the Sun, reach a maximum occlusion, then pass out again. *Never, ever, ever, view the Sun with your naked eyes. It's incredibly bright, even under a partial eclipse, and irreperable damage can be caused in seconds. Always use appropriate protection, or better still, use a sensor and view the event from its perspective. (When you experience a total eclipse, the penumbra passes over you first so you also see the Moon's disc carve its way into the Sun, then experience the total eclipse, followed shortly by the other side of the penumbra as it moves over). If you are located on the planet outside of the penumbra, you'd have no idea that any form of eclipse was occuring. Below is a map showing the path of an eclipse that will pass over North America in August of 2017. The eclipse shaddow will move from West to East. The center red section shows the locations were a total eclipse will be experienced. The orange band surrounding this is where a 90% occluded eclipse will be experienced, and the band surrounding this shows the threshold where 40% of the Sun will be obscured. Why are eclipses so rare? The moon orbits the Earth once every 27.322 days, so why don't we get an eclipse about once every 28 days? After all, at some time in every Moon orbit it would syzygy with the Sun. Eclipses should be quite common, but they are not. Why not? The answer is because the Sun, Earth, and Moon are not in the same ecliptic plane. The Moon orbits the Earth in plane at an inclination of 5.14° to the plane that Earth orbits the Sun. An eclipse shadow is always created by the the Moon, it's just that, unless it happens to occur when the Moon is near the ecliptic plane of the Earth, the shadow passes 'above' or 'below' the Earth and we never observe the eclipse on the surface. For a solar eclipse, the syzygy requires the superposition of the Moon being in the correct position 'vetically' (meaning on the Sun-Earth ecliptic plane), and 'rotationally' (meaning all three bodies lined up when viewed from 'above'). Solar eclipses occur only when a new Moon (it has to be a new Moon because of the syzygy) takes place near a lunar node (where the two orbital planes cross). The math is complex, but the result of this geometry is that there are only an average of about 2.4 eclipses in a calendar year. The syzygy can occur the other way around, with the Earth obscuring the Sun from the Moon. Our Moon 'glows' at night; not because it is incadescent, but because it is refelecting light from the Sun. 'Moonlight' is just reflected sunlight. If the Earth gets inbetween the Moon and the Sun, it is denied this light. You might imagine, therefore, that during a lunar eclipse that the Moon would go totally dark. Instead however, something else just as interesting occurs: It turns a dark orangey/red! This is often called a Blood Moon. What's going on? Well, the atmosphere on the Earth acts like a lens, and refracts the sunlight passing through it and bends some of it so that it hits the Moon. This light is reflected back. 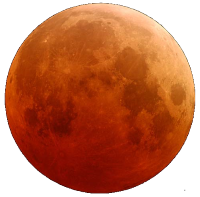 Similarly to how on Earth, during sunrise and sunset, the sky appears red due to a phenomenum called Rayleigh Scattering, the light refracted onto the Moon that is reflected back, has a reddish tint. We are on the body casting the shadow during a lunar eclipse, so everyone on the night-side of the Earth can see a lunar eclipse. During a solar eclipse, you must be within a narrow path, where the Moon's shadow falls. It should be no surprise that solar eclipses and lunar eclipses tend to come in pairs – a solar eclipse always takes place about two weeks before or after a lunar eclipse (by which time the Moon will have orbited around to the other side of the planet). There's actually a third kind of eclipse that can occur, and this is when the Sun is in syzygy between the Earth and the Moon. This is given the name Apocalypse. It's not quite as simple as this, however. Orbits are not perfectly circular. Orbits are actually ellipitcal, with something called the barycenter at one of the foci. The barycenter is the combined center of mass of the system in question. If you've ever watched an Olympic hammer thrower spin-up before he throws his hammer you will appreciate that characteristic wobble. The animation on the right also depicts this. This causes something called precession, which is fancy word for saying the orbits change over time. The two major effects are Nodal Precession and Apsidal Precession. Nodal Precession changes the position by which the orbit crosses the ecliptic plane. 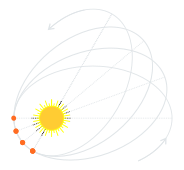 Apsidal Precession rotates around the semi-major axis of the orbit (shown left). These effects, and elliptical nature of the orbits, change the distances between Moon and the Earth, and the Earth and the Sun. These changing distances adjust the size of these bodies as seen from the Earth, and thus the angles they subtend in the sky. The effects are quite pronounced. 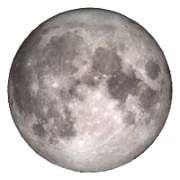 The size of the Moon can change up to 6% from the mean size. 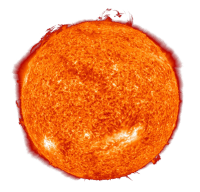 (The changes in the size of the Sun are smaller). If the Moon is smaller than the Sun, something interesting happens; It's not able to entirely obscure the Sun, even when perfectly lined up. This results in something called an Annular Eclipse. (see below). On average, the Moon appears smaller than the Sun (as seen from the Earth) over 60% of the time, and so the majority of eclipses experienced are annular. It is only when the Moon is closer to the Earth than average (near its perigee) that a total eclipse occurs. The Moon at it closest (perigee), is larger than the Sun at is nearest (perihelion), but the Moon at it farthest (apogee) is smaller than the Sun at it farthest (aphelion). In between all these four extreme points of the envelope, all the flavors of eclipses occur. Above is a table showing the four extremes of distance for both the Moon and Sun from the Earth. What happens in an annular eclipse? Annulus comes from the Latin word meaning 'ring'. When the angle subtended by the Moon is smaller than that subtended by the Sun, the Moon cannot entirely obscure the Sun. The sky darkens considerably and a specatular ring appears around the edge. The name given for the part of the shadow that touches the Earth is called an antumbra. The longest total eclipse known (out of all those so far calculated) will be the one on July 16, 2186. Lunar eclipses tend to last longer than solar eclipses. The maximum theoretical duration of totality in a total solar eclipse is 7:30 minutes, while totality in a total lunar eclipse can last up to 100 minutes. On average, a total lunar eclipse can be seen from any given location every 2.5 years, whilst it takes about 375 years for a total solar eclipse to happen again at a specific location. Most calendar years have 4 eclipses, which is the minimum number of eclipses that must take place in a year. Two of these 4 eclipses must be solar eclipses. Whilst rare, the maximum number of eclipses that can take place in a calendar year is 7 (5 solar and 2 lunar eclipses or 2 solar and 5 lunar eclipses). 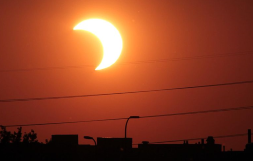 There can be at least 2 and at most 5 solar eclipses in a year. Out of these, no more than 2 eclipses can be total eclipses of the Sun. It is quite rare for a calendar year to have 5 solar eclipses. Only about 25 years in the past 5,000 years have had 5 solar eclipses. The last time this happened was in 1935, and the next time will be in 2206, when two solar eclipses will occur in December. 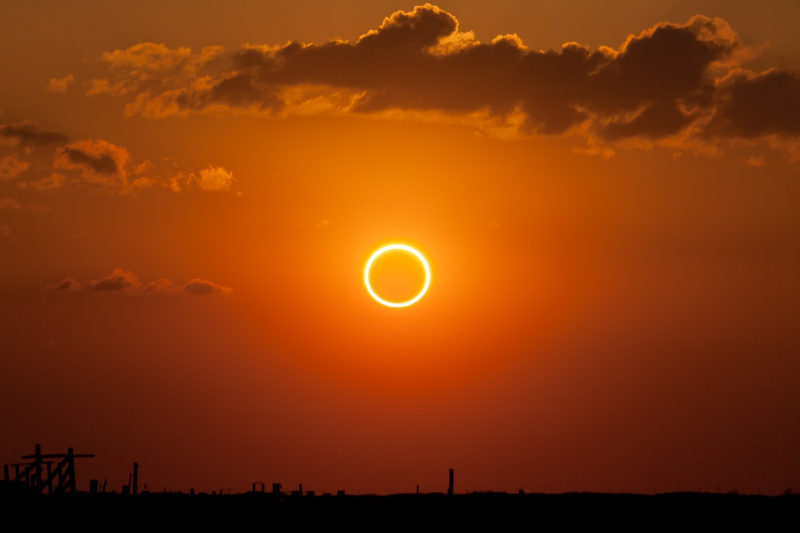 An annular eclipse can last anywhere from 5 minutes to up to 12 minutes. Solar eclipses tend to occur in cycles, called eclipse cycles (approx every 18 years). Astronomers and scientists use eclipse cycles to predict eclipses and calculate their features. One of the most popularly studied eclipse cycles is the Saros cycle. The ancient Babylonians used it to predict lunar eclipses. Solar eclipses occur only when a new Moon takes place near a lunar node (where the two orbital planes cross). We're lucky to be living in the time perdiod where we are able to experience eclipses. Hundreds of millions of years in the past, the Moon was too close to the Earth to occlude the Sun as it does during eclipses today. The Sun gets bigger with time, and the Moon further away. The last total solar eclipse on Earth will occur about six hundred million years from now. You can find a complete list of all the solar eclipses in the 21st Century here. The width of the path of totality can increase up to 267 km at perigee. The shadow of the eclipse moves over the planet at the poles at close to 2,000 mph. Nearer the equator, it is closer to 1,000 mph because the Earth if also spinning around and the rotation of this helps slow the progress of the shadow by keeping partial pace.